Following on from the success of the SA and VA saloons, the WA, announced in 1938 at the Motor Show, was to be the largest saloon yet produced by Abingdon. The car was similar in shape to the SA with quite stunning coachwork, however the interior was much more luxuriously appointed and there was more power available from the modified SA power unit. To understand the reasons for the introduction of this beautiful limousine we must go back to early 1935 and the revolution that swept through Abingdon. At this time not only was the racing programme curtailed but the amalgamation of MG with Morris and Wolseley was to have far reaching effects. Leonard Lord was appointed as the new Managing Director of the MG Car Company when Nuf-field sold the concern to Morris Motors in July 1935. Cecil Kimber was retained at Abingdon but there was very little that he could do without the consent of Lord. Initially Lord said that he did not want to introduce any more MG sports cars as they interfered with his plans to streamline the organisation. Kimber however managed to retain some influence over the decisions and he did muster enough support to eventually change Lord's mind. The end result of this conflict between Lord and Kimber was the introduction of the two litre SA Saloon in October 1935. Lord favoured this model as it was to be aimed at the lucrative luxury sports saloon market. This car was very closely based on the Wolseley Super Six and it was considerably bigger than any other MG previously produced. The idea behind this model was that it would enhance the company image and move away from the stark and somewhat basic sports cars that had made MG famous. The MG purists were a little dismayed with this new offering from Abingdon as gone was the familiar MG chassis to be replaced with a heavy conventional box-section Wolseley based variety. Also gone was the trusty overhead camshaft engine to be substituted with the Wolseley based Super Six two litre pushrod operated unit. With all this rationalisation of parts, Lord thought that all that was necessary to sell a Wolseley at an inflated price was to put an MG radiator shell on it and wait for the queue of buyers. Kimber and his supporters were soon able to dispel this theory and in the end he was given dispensation from Lord to design a new MG body for the Wolseley chassis. This he did with great success as evidenced by the very attractive and well proportioned body of the SA, although the car did suffer from the very inefficiencies that Lord was trying to eradicate with numerous component changes in order to take advantage of the standard items utilised by Wolseley. Ultimately the car did lose a lot of sales to the rival Jaguar SS due to delays in production once the model had been launched. 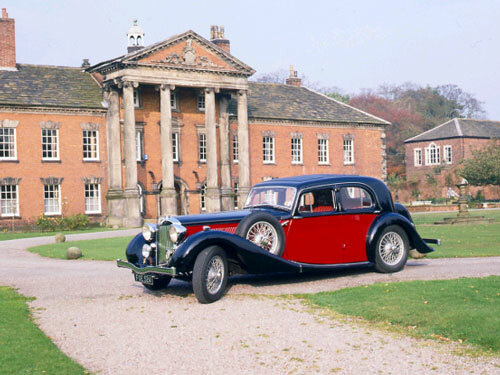 In 1936 the MG VA was introduced and this strongly resembled a scaled down version of the SA and was likewise available as a Saloon, Tourer or Tickford convertible. The saloon was particulary smart in appearance and was distinguishable from the SA by its front wing mounted spare wheel. The VA or one and a half litre model as it was known was powered by a 1548cc four cylinder engine and had a wheelbase of 9' and a track of 4'9". Unfortunately it took just as long as the SA to put into production and likewise it suffered many production changes throughout its life. The VA however was a particular favourite with Cecil Kimber and he considered it one of the best looking cars that he had been associated with. His own personal VA saloon was modified and was fitted with a bored-out 1703cc engine that also powered some special VAs that were engaged on Police duties. It could be assumed that MG had taken the large saloon concept far enough with the SA and VA models and had departed from the sports car image sufficiently (except for the TA Midget) to satisfy this sector of the market, however in the summer of 1938 the saloon car range was rounded off with the introduction of the WA or 2.6 litre saloon. This was an improved and larger engine SA that utilised a power unit not seen in any other Nuffield product of the time. There was an experimental version produced with a three and a half litre engine that was used in the top of the range Wolseley. This lorry based power unit however was found to be too heavy for the MG application and a modified SA engine was employed in the end. The WA was undoubtedly the mosi luxurious MG ever to be produced by Abingdon and whilst superficially similar to the SA model, the body was far roomier and much better appointed. The comprehensive dashboard carried four smart octagonal instruments with a 100mph speedometer, revolution counter, water temperature, oil pressure, fuel gauge, ammeter and electric clock all incorporated in a neat oxidised silver surround. Immediately below this, neatly grouped around the ignition switch were rows of switches and warning lights for the other functions of wipers, lights, choke etc. The interior was very nicely finished with comfortable leather seats, leather door panels that sported beautifully inlaid wooden door cappings. Ventilation was well catered for with an opening front screen and individually opening quarter lights on the doors. The chassis was similar to that of the SA, bearing the same wheelbase and front track; however the rear track was widened by more than three inches to improve the ride comfort in the rear. The brakes were improved by increasing the diameter from 12" to 14" and it was suggested by Kimber that the system would benefit from a Lockheed dual master cylinder due to the weight of the car. The power unit was derived from the SA engine and much was made of the fact that this was one of the first engines to employ a fully counter balanced crankshaft. The stroke of the engine remained the same at 102mm but the bore was increased from 69mm to 73mm giving a capacity of 2561 cc. With a much higher compression ratio the engine then developed some 20bhp more than in VA form, but then due to the car weighing in more than 300lbs heavier than the VA all this extra power was needed to propel the hefty vehicle at acceptable speeds. Three types of coachwork were available on the WA chassis when it was announced in the summer of 1938. The saloon sold for £442, a Tickford drophead Coupe was available at £468 and Charlesworth Tourer could be secured for £450 but only nine of these were ever produced. Road tests by motoring journals of the day were very few and far between, but those that were published indicated that the WA gave very similar performance figures to those of the SA and VA. The acceleration was deemed unexciting when compared to the MG sports cars, however the WA was credited with a good top speed and the ability to maintain high cruising speeds at comparatively low engine revs. Other attributes were excellent roadholding, positive steering and efficient braking all very necessary considering the size and weight of the vehicle. With war looming over Europe the WA was ill-timed and the wrong type of car to promote in the uncertainty of the future. As a result only 369 WAs were produced. Many purists of the time felt that the S, V, and W range of cars were unwieldy lumbering carriages that were unworthy of the marque, yet it was never intended that this range of cars should be sports cars in the true tradition of MG. It was a deliberate attempt by Abingdon to resurrect the earlier image as producers of refined comfortable and well equipped high speed tourers and whatever legacy these cars left behind them, there is no doubt that during the limited time that they were in production, they were very good sellers with a combined production figure for the S, V and W range amounting to 5,524 cars. Engine: In line water cooled. Horse power (RAC rating): 19.82. Gearbox: Part synchromesh 4 speed manual. Suspension: Half elliptic front and rear. Brakes: Lockheed hydraulic. 14" drums. Track: front: 4'5" rear: 4'8.75"